divergence of less than 0.4mrad, giving you sharp beams and precise projections. The unit is built with Sealed Housing Technology and is cooled through the external cooling fins (bottom part). The very small housing (18,5 x 16,5 x 12,5cm) and the very low weight makes this unit very versatile: Just carry several Pure Micro units in your hand luggage to your laser shows all around the world! Of course the Pure Micro units respect the very latest safety regulations according to IEC-60825 - and even beyond those: The Xscan come standard with Advanced Scan Fail Safety. 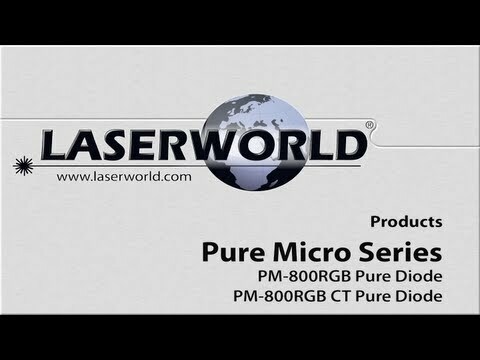 Considering purchasing the Laserworld PM-1200RGB ? Have questions? Ask people who've recently bought one. Do you own the Laserworld PM-1200RGB ? Why not write a review based on your experience with it. 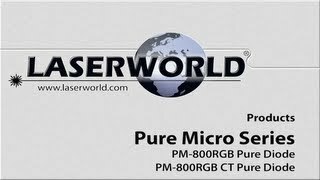 Seen a video for Laserworld PM-1200RGB online or have you own video? You will earn 3,198 loyalty points with this product worth £8.00, when logged in. Check out Laserworld PM-1200RGB on DJkit.com!